The Lost City of Atlantis is still lost - despite hopes that Google Earth had located the fabled city on the floor of the Atlantic Ocean. 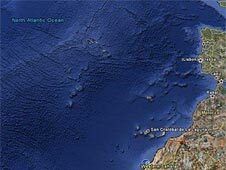 Observers noted what seemed to be a grid of streets and the outlines of a big city on the sea floor about 960km (600 miles) off the African coast. Experts had said this was one of the possible sites of the city described by Plato, the Greek philosopher. But Google said the lines represented sonar data collected from boats. "It's true that many amazing discoveries have been made in Google Earth including a pristine forest in Mozambique that is home to previously unknown species and the remains of an Ancient Roman villa," a Google statement said. "In this case, however, what users are seeing is an artefact of the data collection process. Bathymetric (or sea floor terrain) data is often collected from boats using sonar to take measurements of the sea floor," she added. "The lines reflect the path of the boat as it gathers the data. The fact there are blank spots between each of these lines is a sign of how little we really know about the world's oceans." The story of Atlantis, a fabled utopia destroyed in ancient times, has captured the imagination of scholars ever since it was first described by the philosopher Plato more than 2,000 years ago. He wrote of a land of fabulous wealth, advanced civilisation and natural beauty. Debate rages over where it might lie, if it existed at all: some say it is near Cuba, off the coast of Cornwall, near Gibraltar or in the middle of the Atlantic.